William WaldronThe entertainer and urban-garden activist cultivates a verdant and stylishly cozy world in the New York home she shares with her husband, Martin von Haselberg. Bette Midler, the showbiz force of nature also known as the Divine Miss M, is spellbound by artisanal footnotes, those subtle details that are testaments to the human touch. Finely spaced stitches that secure a delicately ruffled lampshade to its metal skeleton. Fingerprints that bear witness to the intimate relationship between a potter and his clay. The poignant imperfections-smudges, saturations, overlaps-that occur when fabrics and wallpapers are stenciled or blocked one motif at a time. "My mother was a great seamstress, really brilliant," Midler recalls on a spring afternoon at her Manhattan residence, an airy Fifth Avenue penthouse overlooking Central Park's sun-sparkled reservoir. "Because of her I've been crazy about textiles all my life. And my father painted houses for a living. I grew up around people who worked with their hands, so I love how you can see the care and affection that craftsmen pour into their creations." Her husband, Martin von Haselberg, an investor, performance artist, and collector, concurs, explaining that he is drawn to "really juicy paintings" with gutsy brushstrokes or rugged impastos, by somewhat-under-the-radar talents such as Roger Herman, Charles Karubian, and Hubert Schmalix. "We don't have any big names," he adds, in a tone that's anything but rueful. "We almost got a Francis Bacon but didn't have the stomach to go all the way at the auction." Engaging textures are one reason the triplex apartment-where the couple raised their actress daughter, Sophie von Haselberg-has the coziness of a well-loved country house. Another is its Edenic wraparound terraces, conceived by Brian Sawyer of the New York architecture, interiors, and landscape firm Sawyer|Berson. Shell-pink 'Alchemist' roses and aubergine clematises clamber up brick walls, and foxgloves sway above emerald hostas. No peonies, though they are Midler's favorite: Their tendency to collapse in brisk winds makes them "the worst flowers to grow on a roof terrace," Sawyer says. "If you live in the kind of apartment that most people do, you'd want to go sit on a park bench too," Midler says, plainly impassioned. "I lived that way for years when I moved to New York." Now perhaps the lifelong go-getter could also work her magic on the city's architecture? "People suffer from the lack of light in this town," the entertainer professes, warming to the idea. "There aren't enough windows!" That's not the case at Midler and Von Haselberg's penthouse, a mellow spot (it was once two apartments) that was remodeled by Los Angeles architect Frederick Fisher and furnished with decorator Fernando Santangelo. Sunlight streams over a chipper jumble of periods and styles, thoughtfully acquired yet casually deployed. "I don't make a study of anything -- if I fall in love with something, I want it. For me, working in many media, it's hard to just do one thing," says Midler, whose latest triumph was a 2013 Broadway run as the notorious talent agent Sue Mengers in the play "I'll Eat You Last." 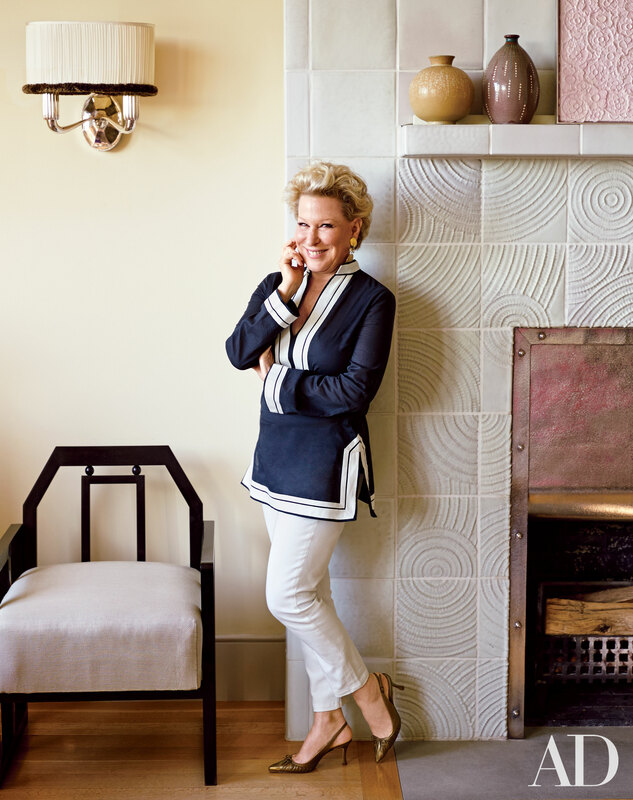 Bette Midler strikes a pose in the living area of her New York apartment; the home was remodeled by Frederick Fisher and Partners Architects, decorated with Fernando Santangelo, and landscaped by Sawyer|Berson. The fireplace tiles were handmade by Kim Dickey. Ebonized vintage furnishings by the Austrian architect Josef Hoffmann sharpen the neutral-tone living area, which also includes a pendant light of his design. The curtains are made of a Scalamandré silk, the cocktail table is by Fernando Santangelo, and the button-tufted armchairs are from Olivier Watelet; Midler found the Art Deco carpet on a trip to Paris. ‘Alchemist’ climbing roses flourish on the adjacent terrace; the cushions on the McKinnon and Harris chairs are clad in a Perennials fabric, and the steel-and-glass railing is a Sawyer|Berson design. Another terrace is outfitted with custom-made Sawyer|Berson furnishings that were inspired by a ’30s suite designed by Jean-Charles Moreux and Bolette Natanson; the cushion and pillow fabrics are by Perennials. Check out more of Bette's home on ArchDigest.com. Read about Bette's home and restoration projects.